Keep on Rowland: Just in time. I will continue to tip toe around my thoughts and concerns on the subject and instead focus on my thankfulness for never having to experience anything close to what this poor child did. He discusses the brutal and sick abuse that his mother bestowed on him for years. 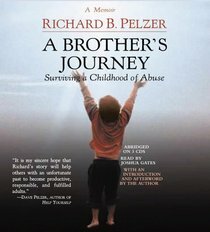 Living in a cold and moldy basement, unable to eat, beaten nearly to death countless times and even being forced to throw up on the kitchen floor and then eat it are just a few of the abusive antics that Richard Pelzer's mother took to break this poor child down. Some sense of morbid curiosity takes control when reading a novel like this.. It's kind of like when you are driving down the interstate and you see a fatal car accident. Your heart sinks as you think of the poor victims, but you can't control yourself from rubber-necking to see the remains of the accident. Its our human nature. Richard Pelzer's story was one of courage. I was never abused as a child or adult in any form or fashion and I am incredibly thankful for that, but Richard's story gave me a sense of courage somehow. It gave me an overwhelming sense of thankfulness as well. I am incredibly thankful to have the 4 amazing parents that God has blessed me with. I have 4 incredible parents who have never once placed a finger on me. They have never put me down in an emotionally abusive way. Instead, they have sacrificed, provided and encouraged me to be the best that I can be. For this, I am forever thankful. Parents do not place the proper importance on how much childhood memories can mold a person for the good or bad...and for the rest of their lives. If you are a parent, please take time to consider not only your words with your children, but also your actions. Your support, love and encouragement do not always come in the form of words. Love on your children and be thankful for them every day. When I started reading this book, I thought it may be a weird book and a weird time to read it, but now I see that it came just in time... Just in time for Mother's Day. Just in time for me to once again realize how amazing my mother and stepmother are. Thank you so much for 25 years of sacrifice, love and encouragement. I am forever thankful to have you both! Happy Mother's Day!